Though not officially part of the Eagles Nest Trail, Jasna Góra (Bright Mountain) bears inclusion for its relevance as the reason thousands of pilgrims hike the Eagles Nest Trail on foot from Kraków to Częstochowa each year. 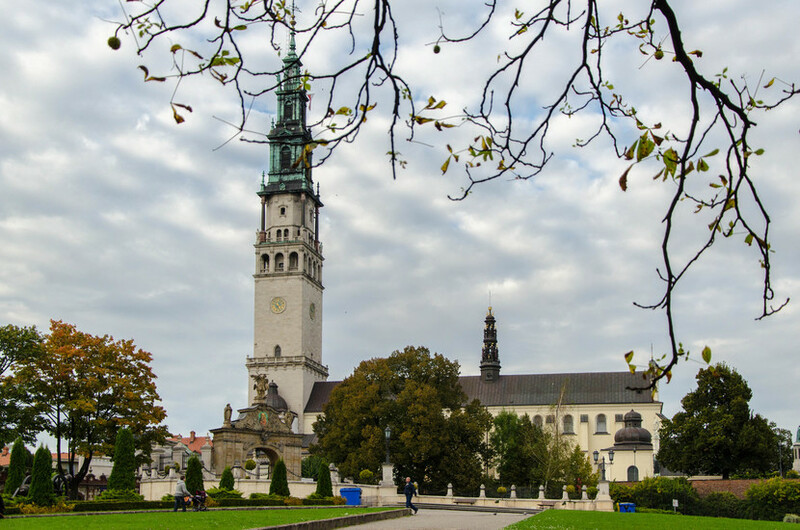 Positioned atop a 340m limestone hill, this immaculate 14th century Pauline monastic complex is Poland’s national shrine and home to its most sacred religious artefact — the Black Madonna. On display in an altar hung with offerings presented by the more than 4 million pilgrims from around the world that visit the site each year, cluttered with the discarded crutches of those who have been healed, the Black Madonna is the source of endless legends of miraculous deliverance. Its origin is shrouded in mystery; while claimed to have been painted by St. Luke the Evangelist, many scholars put its creation at a later date and rather wide berth between the 5th and 14th centuries with its geographical origins ranging from the Middle East to Italy and Hungary. 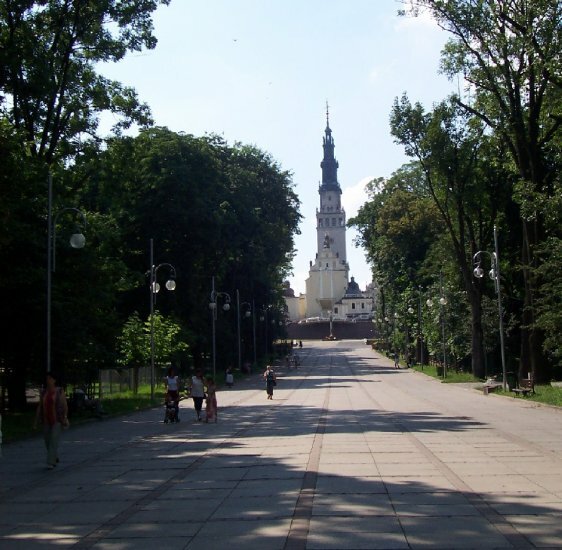 The Gothic Chapel of Our Lady of Częstochowa which displays the icon is the oldest part of the complex, dating from the 15th and 17th centuries. 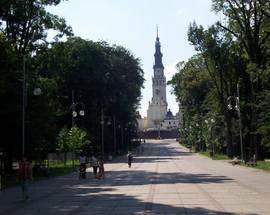 It’s tower, rebuilt in 1906, has the tallest spire in the country at 106m, and the entire monastic complex and surrounding fortifications are a registered UNESCO World Heritage Site. 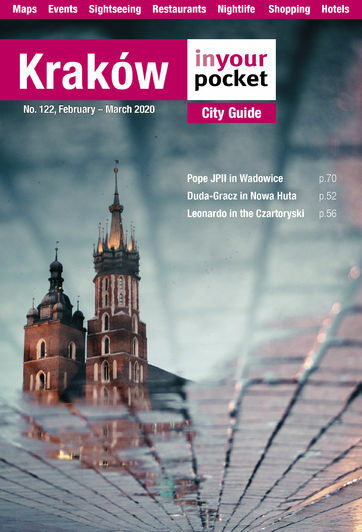 Częstochowa offers a wealth of religious and cultural sites to tourists including the Match Production Museum, whose proximity to the country’s most important religious icon seems to confirm its miraculous powers of self-preservation. Since 1717, an annual walking pilgrimage has set out for Jasna Góra from all across the country; while visited year round, the most popular pilgrimage periods are during the Marian feasts, particularly the Day of the Assumption on August 15th and the Birth of the Virgin on September 8th. As such, if visiting sites along the Jura Upland during the second week of August or first week of September, you can expect to see hundreds if not thousands of pilgrims making this scenic journey on foot from Kraków to Częstochowa. 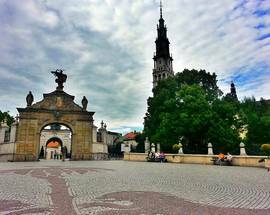 Getting to Jasna Góra from the Częstochowa bus station is a 30 minute walk (a mere trifle compared to from Wawel) or take bus 11. 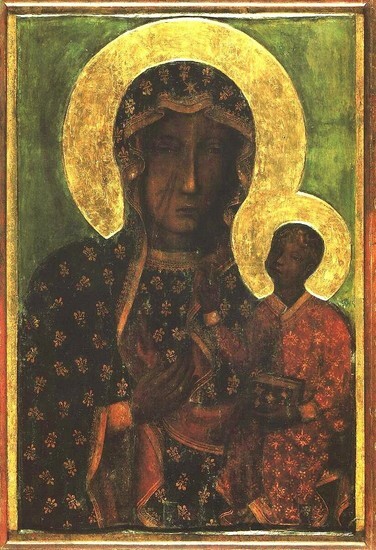 According to legend, Prince Ladislaus of Opole discovered the Black Madonna (age, ethnicity, birthplace: unknown) in the Ukrainian city of Belz where it was venerated for its miraculous properties after a mysterious cloud enveloped the chapel housing the icon during the looting of the city, thus protecting it from the grubby clutches of the Tartars. Ladislaus liked the painting and apparently took it with him, bringing it to Poland in 1382 and bestowing it to the Pauline monks who had recently been granted a monastery in Częstochowa. 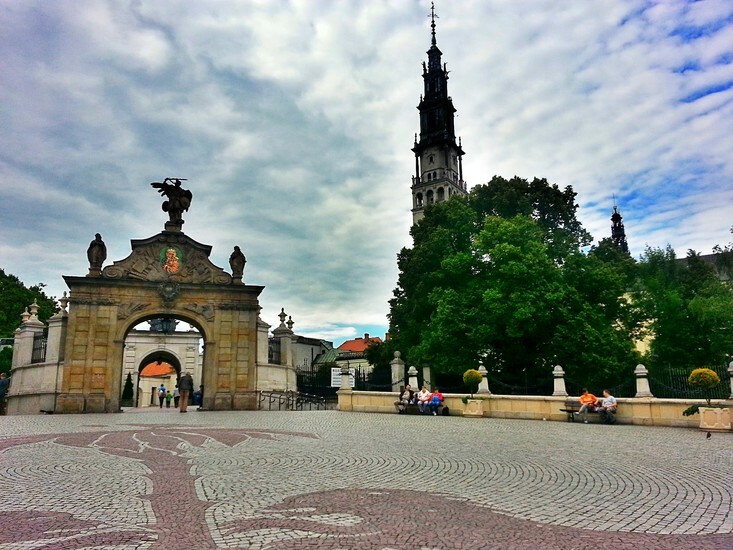 The image was soon under attack again in 1430, however, when Hussites attacked Jasna Góra and desecrated the icon. According to the accounts of the Pauline monks, the icon was thrown to the ground in a rage, upon which it broke into three pieces. A Hussite soldier, outraged that the head of the Blessed Virgin had remained intact, struck it twice with his sword and promptly went blind. On returning to the monastery, the monks found the Madonna shattered in a puddle of blood and mud. Upon collecting the pieces a fountain suddenly appeared wherein they were able to clean the icon. 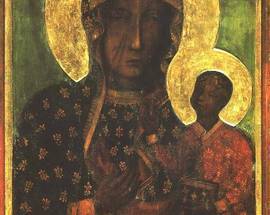 Putting it back together, the monks went to Kraków to lodge a formal complaint with the king, after which King Jagiello kept it in Wawel and had his best artists restore and repaint the image, with the exception of the two gashes on the Madonna’s face which can be seen today.